Begun in 1666 the Canal du Midi is one of the world's most picturesque waterways and a World Heritage Site. 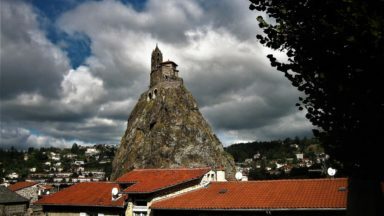 This is 'La France Profonde', a region rich in history and culture, as seen in the grand homes and chateaux that grace the water's edge, and the fascinating Cathar strongholds of Carcassone, Lastours and Minerve. Trains are beginning to get back to normal. There have been bus transfers between Carcassonne and Narbonne since last Tuesday. Some trains are now travelling that line and they should be back to normal by Monday. Note that those planning to use the train on this stretch of line should check in advance until Christmas to make sure that there isn't a bus substitute for continuing works - buses don't have room for or take bikes. The path too is recovering but there is still mud and water lying on it and in the surrounding area from Carcassonne to Béziers. The path between the bridge after Portiragnes and Agde is no longer recommended for cycling. Instead, follow the asphalt track as it swings right. Shortly afterwards, come to a cross roads with a road going left from the main road as you travel towards the beach (plage). Cross the main road and follow a sign for Vias. Keep following signs for Vias as this minor road snakes through marsh, campsites and open fields. You pass Port Cassifieres on your right. (Please take the spelling from the book as there is an accent grave on the first e). Continue taking a right turn following signs for Vias. You eventually come to a small track to the left that leads to the Libron works. Continue towards Vias crossing the bridge over the Libron. Pass the Europark on your left until you reach a junction which you go through towards the old stone bridge at Vias. The get from Vias to Agde, continue on the road on the southside of the canal. Cross over a bridge over a canal leading to the Mediterranean. Swing right and follow this small road as it twists and turns before heading north. Join a main road turning right (D32E12), pass under a bridge carrying a major road (D612) and veering slightly right come to a cycle path which will eventually lead to the banks of the Hérault river. Follow these upriver to the main bridge into the town and continue further if you wish to see Agde's round lock. 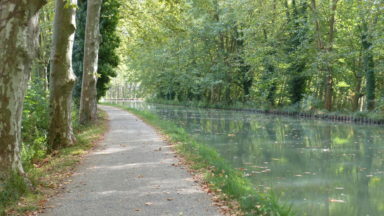 16th Oct -Please be aware due to severe floodings the Canal du Midi canal towpath is not cyclable and is potentially very dangerous for the next few days at least. Eight years on from the publication of the original, an updated version of the definitive English language guide to this fascinating canal ride is very welcome. Conveniently beginning in Toulouse, the Canal du midi passes through a region with a tumultuous history and, as ever in France, distinct identities and cuisines. 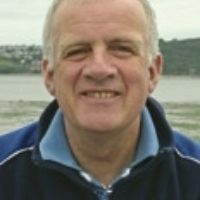 Declan Lyons’ guide will not only allow you to plan and keep you on track, it will also inform and enthuse. Yet, take note of his advice; there’s more to following a canal than might be expected and things can get very hot. author says, the chief engineer, Pierre Paul Riquet, did not intend to create a fabulous 240km cycle track, but did a pretty good job. 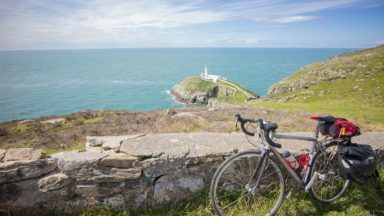 A route for the touring cyclist, not the racer; to be savoured rather than rushed. 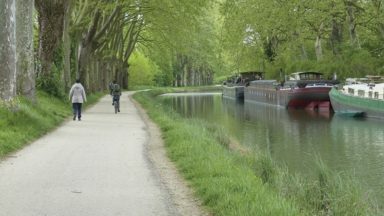 On that note, there is very good guidance on the condition of the towpath for cycling. Some sections are barred to cyclist - though few and far between - and some others are rough and offer some challenging riding, despite being designated as cycle routes. Other sections have a very good surface. Sometimes sudden availability of funds may lead to major improvements. Updates, when reported, can be found on the relevant page on the Cicerone website. In the meantime, you’ll need to follow the author’s advice on what bike to take and when to follow road alternatives. seem to bring you everything you need in one place; one that will fit into a jersey rear pocket or atop a bar bag with ease. The final appendix covers further reading. Prominent here are books on the Cathars. The canal passes through towns and villages that predate it by many centuries. 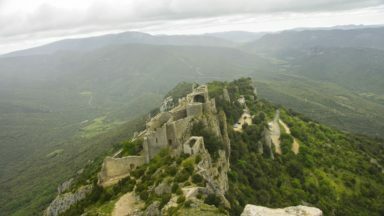 Some had their origin in the ancient past, but many became victims of a brutal crusade undertaken by the Papacy and the French monarchy against Cathar heretics during the middle-ages. Even after this, the region was torn apart during the hundred Years War between France and England. Together, the crusade and the war helped cement French authority in the south of France. Yet, even today, the Midi is different! You’ll get views of mountains, scrubby garrigue and marshy lagoons… as well as following a fine piece of industrial archaeology. To aid exploration, the author does not stick to the towpath bee-line. 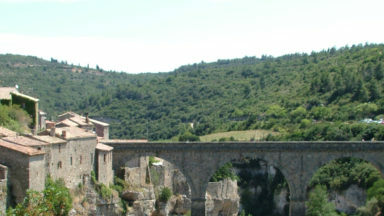 Six excursions are included in the guide, taking in nearby sites, for example to Narbonne and Port-la-Nouvelle (82km). Narbonne was a Roman town, but the author spends a paragraph on Charles Trenet, a singer born there. For some, his songs embody happy sunny days in the south of France. A very appropriate point to recommend this guide and wish you a happy, relaxing, easy-going journey.